The manuscript has to be supplemented by the scan-copy of the signed Copyright Agreement. Authors retain copyright and grant the journal right of first publication with the work simultaneously licensed under a Creative Commons Attribution License that allows others to share the work with an acknowledgment of the work’s authorship and initial publication in this journal. Authors are able to enter into separate, additional contractual arrangements for the non-exclusive distribution of the journal’s published version of the work (e. g., post it to an institutional repository or publish it in a book), with an acknowledgment of its initial publication in this journal. Authors are permitted and encouraged to post their work online (e. g., in institutional repositories or on their website) prior to and during the submission process, as it can lead to productive exchanges, as well as earlier and greater citation of published work. As soon as the paper is accepted, finally submitted and edited, the paper will appear in the “Current Issue” menu of the journal, thus from this point, no other internet-based publication is necessary. © 2014-2019 Sumy State University. 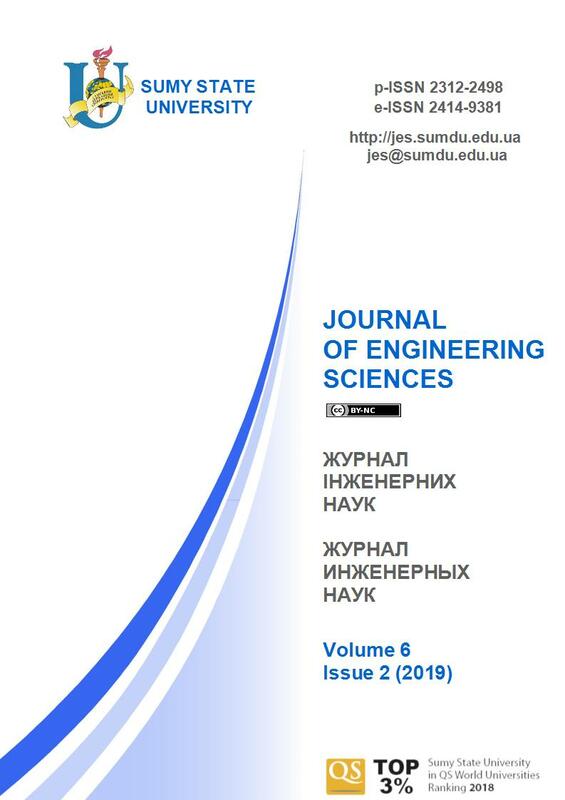 Scientific journal "Journal of Engineering Sciences"
ISSN 2312-2498 (Print), ISSN 2414-9381 (Online).